Thinking a lot about breath and the word lately. What did the Trinity do before they got into the creation business? I think they just abided, in perfect harmony. And the Word Was. The Breath of God was there. The three in one does not need to create or be busy to be content. 2 Timothy 6:6 "Godly with contentment is great gain". They just were. Abiding. At peace. To see God clearly, is to be transformed into His likeness (1 John 3:1-3, 2 Cor 3:18). To be in His presence (is fullness of joy). 2 Cor 6:14 What fellowship does light have with darkness? John 1:5 The light shines in the darkness and the darkness has not overcome it. I'm reminded that the power for transformation is in the Word. In His breath is creation, healing, peace and joy. I too often look to the wrong place to overcome the world, as if my efforts, determination, therapy and all that can hold back the darkness. Psalm 94:11The Lord knows the thoughts of man, That they are a mere breath. In Psalms 94:11, God tells us that our thoughts are not much, a mere breath. Our breath is not like His. God's breath brings life or death. With God's breath life is given. God places great esteem on words. Is a word spoken in right circumstances. In the beginning God created the heavens and the earth. 2 The earth was formless and empty, and darkness covered the deep waters. And the Spirit of God was hovering over the surface of the waters. And evening passed and morning came, marking the first day. And evening passed and morning came, marking the second day. 9 Then God said, “Let the waters beneath the sky flow together into one place, so dry ground may appear.” And that is what happened. 10 God called the dry ground “land” and the waters “seas.” And God saw that it was good. 11 Then God said, “Let the land sprout with vegetation—every sort of seed-bearing plant, and trees that grow seed-bearing fruit. These seeds will then produce the kinds of plants and trees from which they came.” And that is what happened. 12 The land produced vegetation—all sorts of seed-bearing plants, and trees with seed-bearing fruit. Their seeds produced plants and trees of the same kind. And God saw that it was good. 13 And evening passed and morning came, marking the third day. 14 Then God said, “Let lights appear in the sky to separate the day from the night. Let them be signs to mark the seasons, days, and years.15 Let these lights in the sky shine down on the earth.” And that is what happened. 16 God made two great lights—the larger one to govern the day, and the smaller one to govern the night. He also made the stars. 17 God set these lights in the sky to light the earth, 18 to govern the day and night, and to separate the light from the darkness. And God saw that it was good. 19 And evening passed and morning came, marking the fourth day. 23 And evening passed and morning came, marking the fifth day. 24 Then God said, “Let the earth produce every sort of animal, each producing offspring of the same kind—livestock, small animals that scurry along the ground, and wild animals.” And that is what happened. 25 God made all sorts of wild animals, livestock, and small animals, each able to produce offspring of the same kind. And God saw that it was good. 27 So God created human beings in his own image. And evening passed and morning came, marking the sixth day. So the demons begged Jesus, “If You drive us out, send us into the herd of pigs.” “Go!” He told them. So they came out and went into the pigs, and the whole herd rushed down the steep bank into the sea and perished in the waters. And there *arose a fierce gale of wind, and the waves were breaking over the boat so much that the boat was already filling up. Jesus Himself was in the stern, asleep on the cushion; and they *woke Him and *said to Him, “Teacher, do You not care that we are perishing?” And He got up and rebuked the wind and said to the sea, “Hush, be still.” And the wind died down and it became perfectly calm. There, too, the people were amazed at his teaching, for he spoke with authority. 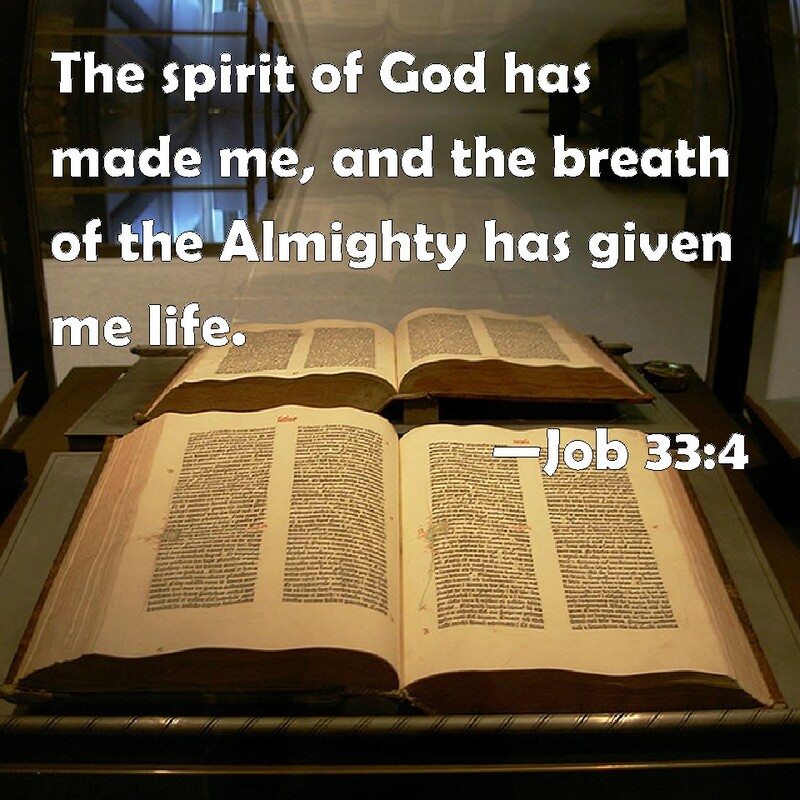 “The Spirit of God has made me, And the breath of the Almighty gives me life. By faith we understand that the worlds were prepared by the word of God, so that what is seen was not made out of things which are visible. Behold, I, even I am bringing the flood of water upon the earth, to destroy all flesh in which is the breath of life, from under heaven; everything that is on the earth shall perish. So they went into the ark to Noah, by twos of all flesh in which was the breath of life. of all that was on the dry land, all in whose nostrils was the breath of the spirit of life, died. Abraham breathed his last and died in a ripe old age, an old man and satisfied with life; and he was gathered to his people. These are the years of the life of Ishmael, one hundred and thirty-seven years; and he breathed his last and died, and was gathered to his people. Isaac breathed his last and died and was gathered to his people, an old man of ripe age; and his sons Esau and Jacob buried him. When Jacob finished charging his sons, he drew his feet into the bed and breathed his last, and was gathered to his people. Only in the cities of these peoples that the Lord your God is giving you as an inheritance, you shall not leave alive anything that breathes. Thus Joshua struck all the land, the hill country and the Negev and the lowland and the slopes and all their kings. He left no survivor, but he utterly destroyed all who breathed, just as the Lord, the God of Israel, had commanded. They struck every person who was in it with the edge of the sword, utterly destroying them; there was no one left who breathed. And he burned Hazor with fire. All the spoil of these cities and the cattle, the sons of Israel took as their plunder; but they struck every man with the edge of the sword, until they had destroyed them. They left no one who breathed. “Then the channels of the sea appeared, The foundations of the world were laid bare By the rebuke of the Lord, At the blast of the breath of His nostrils. [ Elijah Raises the Widow’s Son ] Now it came about after these things that the son of the woman, the mistress of the house, became sick; and his sickness was so severe that there was no breath left in him. the food at his table, the seating of his servants, the attendance of his ministers and their attire, his cupbearers and their attire, and his stairway by which he went up to the house of the Lord, she was breathless. “By the breath of God they perish, And by the blast of His anger they come to an end. “Remember that my life is but breath; My eye will not again see good. “I waste away; I will not live forever. Leave me alone, for my days are but a breath. “He will not allow me to get my breath, But saturates me with bitterness. “He will not escape from darkness; The flame will wither his shoots, And by the breath of His mouth he will go away. “By His breath the heavens are cleared; His hand has pierced the fleeing serpent. 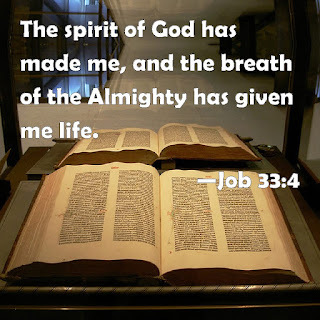 “But it is a spirit in man, And the breath of the Almighty gives them understanding. “From the breath of God ice is made, And the expanse of the waters is frozen. “His breath kindles coals, And a flame goes forth from his mouth. Then the channels of water appeared, And the foundations of the world were laid bare At Your rebuke, O Lord, At the blast of the breath of Your nostrils. Do not deliver me over to the desire of my adversaries, For false witnesses have risen against me, And such as breathe out violence. “Behold, You have made my days as handbreadths, And my lifetime as nothing in Your sight; Surely every man at his best is a mere breath. Selah. “With reproofs You chasten a man for iniquity; You consume as a moth what is precious to him; Surely every man is a mere breath. Selah. The Lord knows the thoughts of man, That they are a mere breath. They have ears, but they do not hear, Nor is there any breath at all in their mouths. Man is like a mere breath; His days are like a passing shadow. For the fate of the sons of men and the fate of beasts is the same. As one dies so dies the other; indeed, they all have the same breath and there is no advantage for man over beast, for all is vanity. Who knows that the breath of man ascends upward and the breath of the beast descends downward to the earth? Stop regarding man, whose breath of life is in his nostrils; For why should he be esteemed? But with righteousness He will judge the poor, And decide with fairness for the afflicted of the earth; And He will strike the earth with the rod of His mouth, And with the breath of His lips He will slay the wicked. For You have been a defense for the helpless, A defense for the needy in his distress, A refuge from the storm, a shade from the heat; For the breath of the ruthless Is like a rain storm against a wall. His breath is like an overflowing torrent, Which reaches to the neck, To shake the nations back and forth in a sieve, And to put in the jaws of the peoples the bridle which leads to ruin. For Topheth has long been ready, Indeed, it has been prepared for the king. He has made it deep and large, A pyre of fire with plenty of wood; The breath of the Lord, like a torrent of brimstone, sets it afire. “You have conceived chaff, you will give birth to stubble; My breath will consume you like a fire. The grass withers, the flower fades, When the breath of the Lord blows upon it; Surely the people are grass. “For I will not contend forever, Nor will I always be angry; For the spirit would grow faint before Me, And the breath of those whom I have made. Every man is stupid, devoid of knowledge; Every goldsmith is put to shame by his idols; For his molten images are deceitful, And there is no breath in them. “She who bore seven sons pines away; Her breathing is labored. Her sun has set while it was yet day; She has been shamed and humiliated. So I will give over their survivors to the sword Before their enemies,” declares the Lord. All mankind is stupid, devoid of knowledge; Every goldsmith is put to shame by his idols, For his molten images are deceitful, And there is no breath in them. Thus says the Lord God to these bones, ‘Behold, I will cause breath to enter you that you may come to life. And I looked, and behold, sinews were on them, and flesh grew and skin covered them; but there was no breath in them. So I prophesied as He commanded me, and the breath came into them, and they came to life and stood on their feet, an exceedingly great army. but you have exalted yourself against the Lord of heaven; and they have brought the vessels of His house before you, and you and your nobles, your wives and your concubines have been drinking wine from them; and you have praised the gods of silver and gold, of bronze, iron, wood and stone, which do not see, hear or understand. But the God in whose hand are your life-breath and all your ways, you have not glorified. “Woe to him who says to a piece of wood, ‘Awake!’ To a mute stone, ‘Arise!’ And that is your teacher? Behold, it is overlaid with gold and silver, And there is no breath at all inside it. And Jesus, crying out with a loud voice, said, “Father, into Your hands I commit My spirit.” Having said this, He breathed His last. And when He had said this, He breathed on them and *said to them, “Receive the Holy Spirit. And as he heard these words, Ananias fell down and breathed his last; and great fear came over all who heard of it. And immediately she fell at his feet and breathed her last, and the young men came in and found her dead, and they carried her out and buried her beside her husband. But after the three and a half days, the breath of life from God came into them, and they stood on their feet; and great fear fell upon those who were watching them. And it was given to him to give breath to the image of the beast, so that the image of the beast would even speak and cause as many as do not worship the image of the beast to be killed.